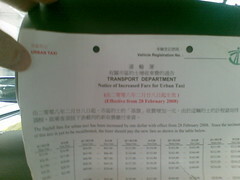 In February the Hong Kong transport department brought out a notice for taxidrivers to allow a 1HKD increase in fees. Quite interesting as the motivation is to compensate for increased fuel costs. However, my guess would be that the longer you drive, the more fuel you use the higher your cost will be. We had a relatively long and cold winter in Hong Kong. For weeks the temperature was between 8 and say max. 14-15C which is cold for here. We had some amazing days with nice weather and clear skies. Unfortunately those days will be postponed. Hong Kong is now entering spring season. Meaning more rain, changing weather..and definitely more humity and higher temperatures. Humidity will start touchin 95%+! Which is very high and uncomfortable. Laundry takes ages to dry, and if you have a shower in the evening...your bathroom is barely any drier in the morning. 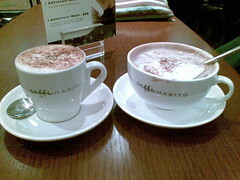 After a nice dinner with friends, we decided to go elsewhere for a coffee....and for some a hot chocolate. We ended up at Habitu, opposite Pacific Place 3. Excellent chocolatie hot chocolate.....and I saw an interesting looking drink. A cappucino Brulee. Interesting idea, a bit too sweeeeeet for me though. Wow...it has been a while! Many things have happened in the last months... and its time to start catching up. 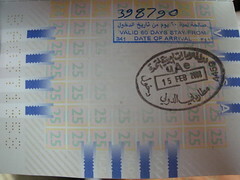 One of the trips I had was to Dubai, to participate in a PRINCE2 training.